Steps to take and files needed. 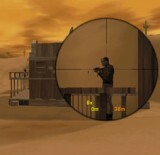 Delta Force: Land Warrior is a game in the Delta Force series from Novalogic. It's a first person shooter game, with networking capabilities. You can play cooperative group missions, save the flag (teams against each other) or deathmatch (everyone is a suspect). Most fun when playing in a network. There's also a map editor, so you can design your own missions. Read more on how to design a map for coop (this site). Green Valley, think it's coop. Green Valley 1, other version. Green Valley 2, other version. Secret Garden, early one I think.